Press Release: Bryce Salvador, NHL veteran, advocates for vestibular awareness among youth athletes. Summary: Concussion recovery may be complicated by vestibular involvement. Vestibular rehabilitation can help. What happens to the brain and vestibular system after concussion? The head strikes a stationary object. Common examples include a fall where the head hits the ground or an object, or hitting the head on an object during an auto accident. An object hits the head, such as a ball or stick during sports, or as a result of human collision. A quick acceleration/deceleration of the head with no contact to any surface. This can occur in dancers and gymnasts due to rapid movement, or during an auto accident where there appears to be no head trauma. These events all cause quick deceleration of the head and shifting of delicate brain tissue inside the skull. Rarely does an accident of this nature occur in a true head-on or forward/backward direction. There is typically a rotational force, as would occur if one were struck on the right or left side of the forehead. If the body is traveling forward or facing forward in a still position, and a force occurs off center, the brain sustains a rotational sheer force, which causes more trauma to brain structures and therefore a more severe concussion. Loss of consciousness and nausea at the time of injury are signs that rotational forces have occurred. Current research on athletes shows that nerve signals in the brain are disrupted for 30 days after a single concussion, and during this time frame people are more likely to have another injury if engaged in sport activities. This is because reaction time and brain processing are not normal. We are less likely to see something, like a ball, coming toward the head during this vulnerable period. 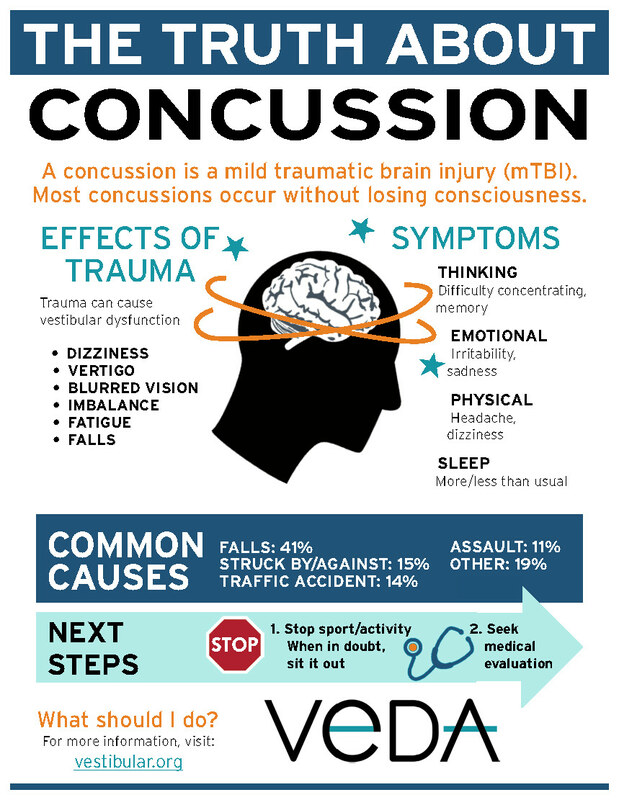 If more than one concussion occurs, the symptoms are typically worse and recovery time is increased. Trauma to the brain can result in abnormal vestibular system functioning, and the brain can receive abnormal signals regarding the position and movement of the head in space. When vestibular information is inaccurate, the brain most often relies on visual input to stabilize the head on the body. This means that the visual system becomes the most reliable system to quickly assess one’s position in space and to remain balanced. Relying upon vision alone as the primary source of balance often leads to fatigue and difficulty performing routine daily activities. 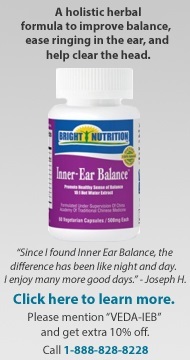 Reliance on the visual system for balance can result in eyestrain and tension headaches. If the vestibular system is delivering inaccurate information to the brain about the head’s position in space, the brain must rely on visual input and joint sensors (proprioception) to feel the body in space. Failure to effectively compensate with the use of visual references and being aware of the surface on which one is sitting or standing results in dizziness and a sense of instability. Dizziness encourages a person to refrain from moving the head, and leads to neck stiffness and headaches. Presence of a whiplash associated with the concussion further complicates the diagnosis and suddenly symptoms limit the ability to participate in life activities. HOW DO I KNOW IF I HAD A CONCUSSION? 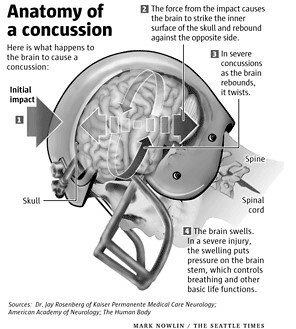 There is currently no diagnostic test for the presence of a concussion. If there is any suspicion of a concussion during sporting activity, an athlete or child should be removed from play to watch and assess behavior, and in many states medical clearance is necessary to legally return to play. If a person develops signs of neurological injury, such as repeated vomiting, seizure activity, loss of consciousness, unequal pupil size, confusion or slurred speech, immediate medical attention is necessary to rule out serious brain trauma. Apart from sports, any mechanism of trauma to the head and neck can result in concussion and should be evaluated if symptoms are present. WHY DO SOME PEOPLE HAVE FEW TO NO SYMPTOMS, SOME PEOPLE SLOWLY DEVELOP SYMPTOMS OVER TIME AND OTHERS FEEL THEY CANNOT FUNCTION AFTER CONCUSSION? It can be normal to have no symptoms after a concussive event. In studies of athletes, almost all subjects are free of all symptoms by three days after injury, while brain studies still show reduced nerve signal transmission and risk of injury for up to 30 days. Other people feel normal for two to three weeks, then have a steady increase in headaches, dizziness or fatigue that at times are not recognized as being caused by the concussion. Fewer people have immediate and more severe concussive symptoms that last for prolonged time frames. We now know some response to concussion can be influenced by genetics. People who have a history of dementia or Alzheimer’s disease in their family can be more at risk for having a worse response after a concussion. This is because some people have proteins (Tau) in the brain that already place them at risk of memory problems, which can be aggravated by concussion. This results in more cognitive difficulties with memory, concentration and motivation after experiencing a concussion. Due to the forces involved in concussion, it is very common to sustain a whiplash injury that is often not diagnosed with the concussion. As the head decelerates or receives the force of an incoming object, the neck muscles are strained. The effects of whiplash injury are not always immediate and can appear two to three weeks later with an increasing number of tension headaches and visual disturbances. Dizziness can also occur related to neck strain. This delayed increase in symptoms can interfere greatly with school and work performance. Finally, many people have previous conditions that make the brain’s response to concussion more problematic. A prior history of migraine headaches can lead to complex migraines after experiencing a concussion. At times migraines can occur without headache and produce only an aura that feels like vertigo or dizziness lasting for multiple hours or days. Failure to recognize and treat migraine activity can lead to prolonged symptoms and places more stress on the brain, limiting recovery. A history of visual disturbances or childhood sensory processing issues also affects one’s response to concussion. For example, if a person had difficulty with distance vision or depth perception before the injury, the brain adjusted to that problem. After an injury, the way in which the brain compensated for the visual problem may not work as well, and the ability to focus on static objects or following moving objects may cause symptoms of dizziness, as well as head pressure, head fog and concentration problems. Likewise, if a prior history of sensory integration problems and history of motion sickness is present, concussion can again cause increased difficulty for the brain to process vestibular information. HOW DO SYMPTOMS OF CONCUSSION AFFECT DAILY LIFE? The concussion injury itself is ‘invisible’, as headache, dizziness, head fog, eye strain and fatigue are rarely perceived by others. Thus, the disruption of the brain’s ability to process sensory input can result in extreme fatigue, frustration and emotional instability. In children, this manifests as behavioral outbursts or tantrums. Highly visual activities overwhelm the brain, so crowded environments (work, school, stores, public events) can cause elevation of symptoms or anxiety. Work and school performance can suffer as concentration and memory are affected. Adjusting visual focus from near and far can cause dizziness and headache. In schools, looking from the desk to PowerPoint presentations or to or boards in front of the classroom is extremely challenging. Children and adults alike report difficulty remembering information and concentrating with reduced accuracy in work performance. Students have trouble completing homework and adults arrive home from work with extreme fatigue and lack of energy to engage in family and household activities. Complex visual environments elevate symptoms of headache, head pressure, dizziness and imbalance, and can cause anxiety. Over time people tend to withdraw from outings and can become depressed from the inability to perform routine daily activities. Crowded places are difficult to navigate because of the movement of people and complex visual background in the observer’s peripheral vision. These visual distractions cause a sense of imbalance and dizziness, often with head pressure, that can lead to panic attacks or avoidance of activity. HOW CAN I BEST COPE WITH SYMPTOMS OF CONCUSSION? The best treatment for symptoms of concussion involves an assessment of vestibular function by a physical therapist. A comprehensive vestibular evaluation should include examination of balance activities that involve the vestibular, vision and proprioceptive systems, which reveals how the brain interprets movement of the body and head relative to space and the visual surround. A cervical examination determines if neck sprain or dizziness from the neck is contributing to symptoms and perpetuating headaches. Based on examination findings, customized exercises and recommendations for participating in or modifying school, work and home activities expedites recovery. If necessary, medical assessment by a primary care physician or neurologist can help determine if migraine headaches are present and whether medication could improve recovery. Finally, those with ongoing eye-tracking problems that interfere with reading and computer related tasks benefit from vision examinations, usually performed by optometrists or ophthalmologists who have completed residency programs in vision therapy and rehabilitation. The following are examples of tips that can help a person reduce symptoms through the day. More specific, personalized recommendations are provided during vestibular therapy, and extensive education regarding how the vestibular system works helps one cope with the recovery process. Limit visual activities to shortened time intervals with frequent rest breaks. Set a kitchen timer to engage in visual activities for 30-45 minutes, then allow for 10-15 minutes to relax the eyes and perform grounding exercises that focus on feeling the body firmly seated in a chair. Use a line guide such as a bookmark or index card when reading to reduce the work involved for the eyes to scan. Listen to books on tape when possible to reduce eye fatigue. Limit scanning/scrolling on the computer, enlarge fonts and adjust the screen settings to reduce glare. Do not save all of your errands for one day, then stay home for 5 days. It is better to do one errand per day to gain some exposure to different environments, return home to calm symptoms down and feel a sense of success and achievement. Saving all your errands for one day will potentially exhaust you and increase the symptoms so much it can take multiple days to recover. Initially a student may need to miss one to two weeks of school, and may not be able to attend full days of school upon return. Try to keep up with work at home as getting behind causes much increased anxiety. Work in short intervals of time. Time extension typically induces stress, whereas volume reduction of assignments can allow for an understanding of material and not getting too far behind. Request copies of presentation material for work or school to avoid rapid movement of visual focus from table to distant targets. “Early passing” (i.e. transferring between classes before or after the large bulk of students) can be requested to avoid visual chaos between classes. A 504 (accommodation) Plan can be established if recovery is prolonged and symptoms are persistently increased through the school day with decline in a student’s performance. Avoid working directly under florescent lighting. Arrive early to meetings and select a seat that provides the least offensive visual background. Avoid looking directly at linear backgrounds such as vertical or horizontal blinds, or a wall of bookshelves. Use lunch time to settle any symptoms and avoid noisy or over-crowded gathering places. As you feel better, gradually join the group. It is important to maintain contact with peers and friends who are supportive, and to remain socially and emotionally engaged. Limit social activities to small groups of people for only one to two hours at a time, and gradually lengthen outings as they are well tolerated. If eating out, go early or late and request a table on the outer edge of the restaurant and face a wall to avoid seeing servers moving in the background. Initially avoid visually stimulating environments such as movies, sporting venues, performing arts venues that have altered lighting, loud noise and stadium style seating. Airports are visually complex, and people do not abide by traffic patterns, causing visual chaos. Arrive early, check in and find a quite location near your gate to sit facing a wall or less stimulating visual surround. Allow 10-15 minutes to feel that your body is still in a chair and to calm any dizziness. While out of town, try to be flexible with your itinerary and allow periods of rest or seated breaks to allow symptom reduction. Foreign environments are more visually complex for the brain to process, whereas the home environment is relaxing and predictable. HOW CAN I PREVENT FUTURE INJURY? The best way to prevent subsequent concussion is to allow full recovery from any injury before resuming activities that are risky. Full recovery means there are no symptoms with any activity, whether academic, work-related, during leisure activities or during sports. Use any recommended safety equipment, ensure all coaches are fully trained in concussion avoidance, identification and treatment, and know your personal concussion history. Stop participating in sports or leisure activities if there is any indication of potential injury to the head or neck, and seek medical attention. Vagnozzi R, Signoretti S, Cristofori L, et al. Assessment of metabolic brain damage and recovery following mild traumatic brain injury: a multicentre, proton magnetic resonance spectroscopic study in concussed patients. Brain 2010;133:3232-42. Terrell T, Bostick R, Abramson R, et. al. APOE, APOE Promoter, and Tau Genotypes and Risk for Concussion in College Athletes. Clin J Sport Med 2008;18:10–17.